It’s a big, abstract word and covers a big field — the study of the changes in the climate over the course of the entire history of earth. Basically, the study focuses on reconstructing ancient climates to better understand our current, and future climate, much as archeologists study ancient artifacts to understand past cultures. Scientists are able to examine various aspects of rocks, ice sheets, tree rings, corals, shells, soils, deep sea sediments, and microfossils — called climate proxies —to understand what climatic conditions were in the far past, even through millions of years. Much of the work relies on analysis of oxygen and carbon isotope records. As a result of their work, paleoclimatologists, for instance, can estimate the air temperatures 400,000 years ago from studying ice cores, and go back one million years to estimate sea surface temperatures from deep sea sediments. Ironically, it was the study of what caused earlier Ice Ages that led to the understanding of carbon dioxide and its influence on global warming. Scientists proposed that the Ice Age was caused by a drop in concentrations of atmospheric CO2, which led to the corollary understanding that a rise in CO2, especially from industrial emissions, could cause the earth to warm. Determine whether there are any climate proxies in your area, and, if so, identify them. 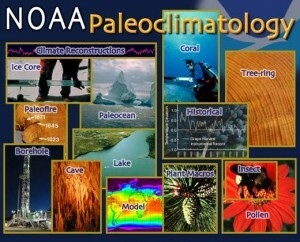 What skills do you need to become a paleoclimatologist? Where would you study to be a paleoclimatologist?